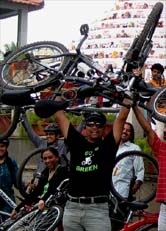 Go Green Critical Mass ride snaps 26 june 2010 - GGI-Group size: 4000+ Professionals, Increasing on day to day basis, Come & join us 2 serve Mother Nature. Heavy Rain stalled us on this Critical mass ride. Planned to start by 3:30pm but Rain god had a different plan for us. We were forced to stay back @ RIS Junction and start only by 4-45pm. Due to heavy pour, only few people participated in this CM Ride.. We were suppose to goto Samim's place by 6:30pm but due to less turn out and rains we called off the plan. 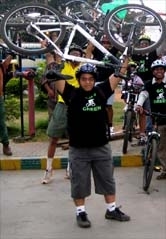 Totally their were 14 participants, TV9 & DNA came to cover our ride. 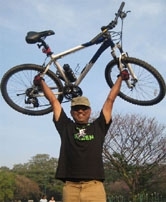 Started from Cubbon Park Press club by 5:15pm. Reached back RIS junction by 7:30pm. RIS Junction -Jaynagar 4th Block - Jnagar 3rd block - Ashoka Pillar, Lalbagh rear gate - Lalbagh front Gate - Double road - Right under flyover - lavell Road - Jewels De paragon - Cubbon park - Bangalore Press Club. Bangalore Press Club - MG Road - Commercial Street - Brigade Road - Garuda Mall - Residency Road - Double Road - Lalbagh front gate - Lalbagh rear gate - Madhavan Park - Swimming pool Road - 4th Block - KFC - RIS Junction. DNA Press Report on our Green Initiative.